“In the words of famous pastry chef Jacques Torres, ‘Life is short. Eat dessert first! '” That statement, made with a characteristic twinkle in her eye, pretty well sums up how Minna Re Shin approaches life. On her Twitter social networking page, Shin describes herself as a performing artist, music theorist, arts blogger and “foodie” who appreciates the finer things in life. In person the petite concert pianist and ardent lover of the arts simply radiates with a natural joie de vivre. Shin began studying piano at the age of six and, within four short years, made her solo debut at the age of 10 with the Montreal Symphony Orchestra under the direction of Mario Duschenes, the well-known German-born Canadian flautist and conductor. That same year she made her radio premiere when she performed work that was broadcast over the Radio-Canada network. Shin never looked back. This dynamic musician has earned high praise as a recitalist, chamber pianist and soloist in concerts with major orchestras, such as the Montréal Chamber Orchestra, the chamber orchestra I Musici de Montréal and the Orchestre symphonique de Trois-Rivières. She has appeared as a guest artist on television programs, and her performances have been widely aired on the radio across Canada. Despite already being an accomplished and renowned performing artist, Shin decided to pursue the academic side of music. “It never hurts to continue to learn. I always had a knack for music theory and analysis, and when I received my first PhD, I was still really young. So I decided to further my education and knowledge in another music discipline,” she says modestly. In addition to her Master and Bachelor degrees in solo performance, Shin holds a PhD in Music in piano performance specializing in 20th-century repertoire from the Université de Montréal and another doctorate in music theory with emphasis on 19th-century music from McGill University. 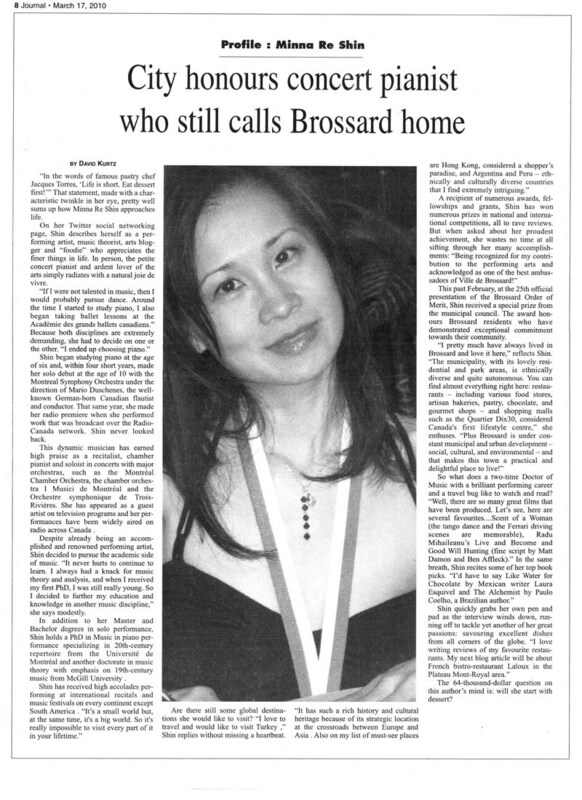 This past February, at the 25th official presentation of the Brossard Order of Merit, Shin received a special prize from the municipal council. The award honours Brossard residents who have demonstrated exceptional commitment towards their community. The 64-thousand-dollar question on this author’s mind is: will she start with dessert? This entry was posted on Monday, May 3rd, 2010 at 11:26 am	and is filed under News. You can follow any responses to this entry through the RSS 2.0 feed. You can leave a response, or trackback from your own site.